Don’t rush to buy new blinds as we can often alter your existing blinds to suit new windows! Along with our thorough clean and repair services your blinds will look and feel brand new again! However if you do need to replace existing blinds or want to install new blinds then we are able to supply high quality blinds of all types and will include a 5 year guarantee for your blinds if they are maintained regularly. 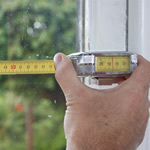 We have a free comprehensive measuring and quotation service, and all new blinds are fitted free of charge for both our domestic and commercial customers. Please contact us for more information, advice and to see the broad range of high quality blinds that we can supply to meet your individual needs.